GTI badges!?! We don’t need not stinkin’ GTI badges! Yeah, I know that’s bad even for me, but its the first thing that popped into my head after reading the latest on Volkswagen’s king of the Golfs, the VW Golf R.
This the fourth generation of R-designated über Golfs. Up until the last model, however, they were known as the Golf R32. So, for those keeping score at home, that’s two Golf R32s (Golf Mk4 from 2003 and Golf Mk5 from 2006) and now two Golf Rs (Golf Mk 6 from 2010 and the Current Mk 7). The VW Golf R32s and Golf Rs have always been designed to be the best a Golf can be, kinda like the recent Ferrari 458 Speciale. Serious performance, power and handling tweaks combined with go-fast styling, exclusive R badging and really, really good racing-like seats to create a pretty good hot hatch. The first gen Golf R32 had 237 horses and a 0-60 mph time a bit above 6 seconds. 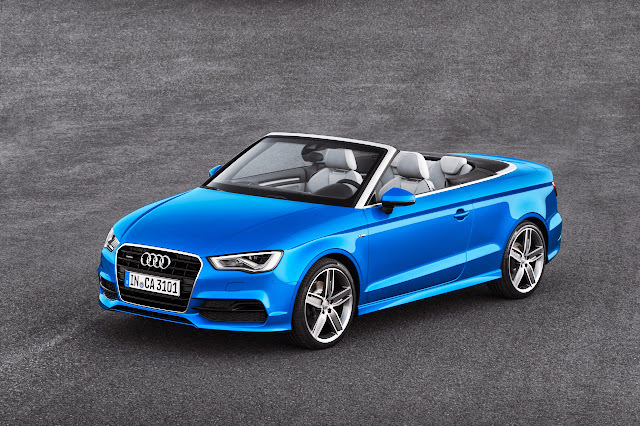 The next generation saw a bump up to 247 hp, bringing the dash to 60 down to about 6 dead. 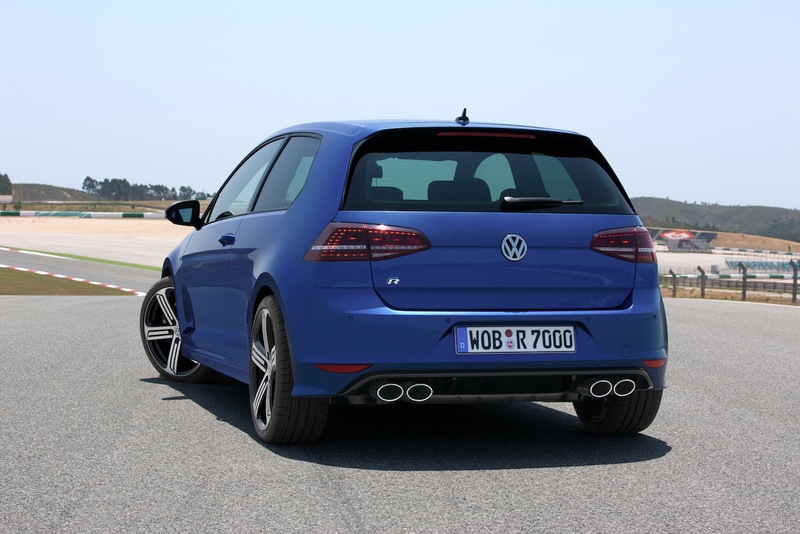 261 hp and about 5.4 seconds came with the 2010 Golf R.
Now, however, VW means business. Set to shed its cover officially at the Frankfurt Motor Show in a few weeks, the Volkswagen Golf R should be a lot of fun as it gets the biggest power increase so far, up to 296 hp and 280 pound-feet of torque. That’s a gain of 35 hp. It’ll trot from 0-62 in 4.9 seconds (0-60 in ~4.7) with the optional dual-clutch trans and happily keep going all the way to 155 mph. That is some serious oomph. Routing the Golf R’s power to all four wheels is that optional six-speed DSG transmission I mentioned or a standard six-speed manual. Although, we’re not exactly sure when the VW Golf R will make it to North American shores or even what a US-spec version will consist of. But, we do know Europe will get theirs in the fourth quarter of 2013 with a sticker starting at €38,325 ($51,283). A good guess for US pricing would be just a bit north of the current Golf R’s $34,195 starting price. There’s a fair amount of details on the Volkswagen Golf R in the tech specs and press release below. So, take a look. Front: Strut-Type with Lower Control Arm and Anti-Roll Bar. Wolfsburg, August 2013 — This is the year of the Golf. The first six months of 2013 have already seen the European debuts of the new Golf GTI, Golf GTD, Golf Variant, and Golf TDI BlueMotion. Volkswagen is continuing its Golf product offensive with the flagship of the model series — the new Golf R. The sports car of the lineup is powered by a newly designed 296-horsepower TSI® engine, which is 30 hp stronger but up to 18 per cent more fuel efficient than the engine in the previous model. Like all three previous Golf R models, the new model also transfers its turbocharged power to the road via a permanent all-wheel drive system; in this case, the latest version of the 4MOTION® system with a fifth-generation Haldex® coupling. To ensure great chassis dynamics, there’s a new sport suspension, the progressive variable-ratio steering system, and a stability control system (“ESC Sport”) which can now be deactivated for track driving. Other highlights include the optional DCC dynamic chassis control system that features a Race mode. With a manual transmission, the Golf R reaches 62 mph from rest in just 5.3 seconds, an improvement of 0.4 sec over the previous Golf R. With the DSG® dual-clutch automatic transmission, the car completes the sprint in just 4.9 seconds. The Golf R’s top speed is electronically limited to 155 mph. Despite the car’s exceptionally agile handling and extra power, fuel consumption of the manual Golf R was reduced from 28 to 33 mpg. CO2 emissions also improved from 199 to 165 g/km. Equipped with a Stop-Start system, battery regeneration, and the optional DSG transmission, the car is even more fuel efficient, with an EC Combined figure of 34 mpg (159 g/km CO2). The new European Golf R is equipped with an extensive package of exclusive features. Along with specially designed bumpers, side skirts, and 18-inch aluminum-alloy wheels, the Golf R can also be visually distinguished by details such as: standard Bi-Xenon headlights with newly designed LED daytime running lights (in a dual-U design); dark red LED taillights; and a two-branch exhaust system with four chrome tips. Inside, the Golf R underlines its position as the flagship of the model range with sport seats in a “fabric-Alcantara®” material mix, a leather-trimmed three-spoke sport steering wheel, ambient lighting, automatic climate control, and a touchscreen radio system. The most powerful and fuel-efficient Golf R will be launched in the fourth quarter of this year, in two- and four-door forms. The Golf R has an even more advanced version of the EA888 four-cylinder turbocharged and direct-injection 2.0-liter engine that’s fitted to the new Golf GTI. Compared to the 227-hp GTI engine, the engineers boosted power by 69 hp to 296 hp, delivered at 5500 rpm, thus creating one of the most powerful four-cylinder production engines in the world. Maximum torque has been increased by 22 pound-feet to 280 lb-ft, available over a broad speed band from 1800 to 5500 rpm. To attain this output, the Golf R’s 1984-cc engine was subjected to a motorsports-style development program. The following components were modified or completely redesigned compared to the GTI engine: the cylinder head (together with exhaust valves, valve seats, and springs), pistons, high-pressure injection valves, and turbocharger. Efficient thermal management. Many of the EA888 series engines have innovative engineering solutions such as water-cooled exhaust gas channels running through the cylinder head to the turbocharger (to reduce efficiently full-load fuel consumption) and a dual injection system with direct injection and multi-port injection. Thanks to its new fully-electronic coolant control system, the Golf R’s TSI engine has much more efficient thermal management with a reduced warm-up phase; this reduces frictional losses and fuel consumption. In addition, the TSI engine has variable valve timing on both the intake and exhaust sides, as well as two-stage exhaust-valve lift. This enables optimal control of the charge exchange process for better performance, fuel economy and low emissions. The Golf R has always used 4MOTION permanent all-wheel drive. The latest generation system is now being used in the fourth-generation Golf R. Using refinements such as the Haldex 5 coupling, the 4MOTION system is activated before any wheelspin occurs, eliminating nearly all traction losses. The system achieves this by using an advanced control function based on specific driving conditions. When operating under a relatively low load or when coasting, the front wheels are driven and the rear axle is decoupled, helping to save fuel. However, the rear wheels can be variably engaged in fractions of a second whenever necessary. This is done via the Haldex coupling, which is activated by an electro-hydraulic oil pump. In addition to the Haldex coupling that acts as a longitudinal lock, four electronic differential locks (EDS) that are a function of the electronic stability control system act as lateral locks. The system briefly brakes a wheel that is slipping, enabling uninterrupted and stable transfer of drive power to the wheel on the opposite side. In addition, the Golf R is equipped with the cross differential lock (XDS) at the front and rear axles. In the latest version, known as XDS+, this functionality is applied to a larger range of dynamic performance, making the vehicle more agile. When the car is being driven fast, brake pressure is applied to the inside wheel to restore optimal traction as soon as the electronics detect excessively light loads. XDS+ thereby operates as a transverse differential lock that compensates for understeer during fast cornering. The new Golf R is equipped with “ESC Sport” as standard. The system is activated by a two-stage switch on the center console. When the driver presses this switch briefly, Electronic Stability Control (ESC) switches to the “ESC Sport” mode. In very fast driving with lots of bends, such as on a race track, the ESC system has a higher threshold. When the ESC button is pressed for longer than three seconds, the system is fully deactivated for high-performance driving on a track, a feature that is available only on the Golf R.
The Golf R features a sport suspension setup that is specifically tuned to the car. Compared to the base Golf, its ride height was lowered by 0.8 inches, which makes the Golf R lower by 0.2 inches than the GTI. In the Golf R, the strut-type front suspension has a newly developed lower wishbone and the multi-link rear suspension was enhanced with new tuning of the toe link bearings. 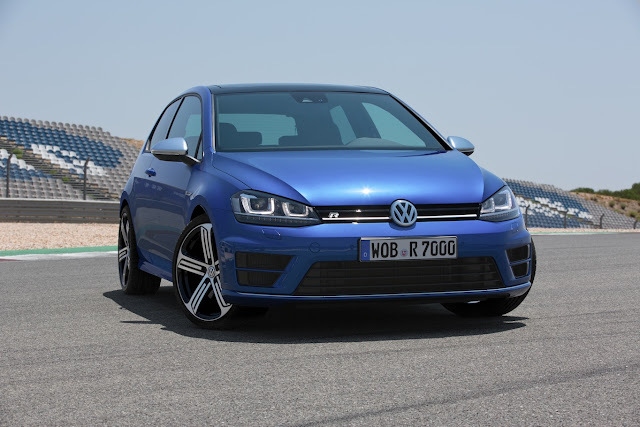 Like the Golf GTI, the Golf R is equipped with the newly developed progressive steering system as standard. With progressive steering, there are 2.1 turns of the wheel (380 degrees) from lock to lock, compared with 2.75 turns (500 deg) for less powerful Golf models it takes 2.75 turns. The new steering operates with a progressive gear ratio, perceptibly reducing steering effort in maneuvering and parking. 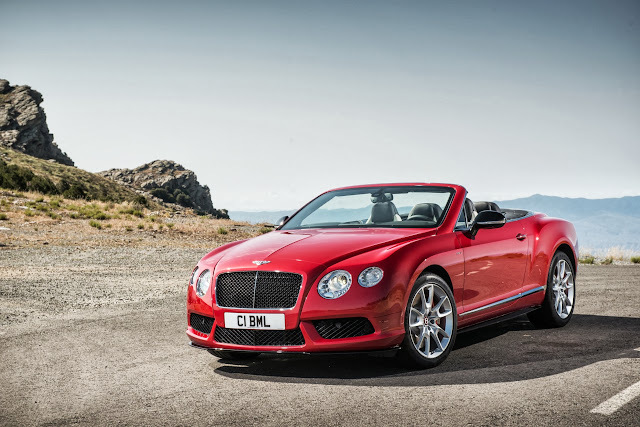 On country roads with lots of bends, the experience is enhanced because the steering is more direct. The DCC system adaptively controls the damper valves via a further developed and refined control algorithm. DCC takes input signals from wheel displacement sensors and accelerometers as well as vehicle information from the Chassis-CAN bus to compute these values and adaptively adjust the optimal damping force for every driving situation. Moreover, damping forces are selectively applied to the four wheels individually. With the new generation of DCC, it is now possible to independently vary rebound and compression damping while cornering. The Driving Profile Selector has four programs in the Golf R, and five in conjunction with DCC: “Eco”, “Normal”, “Individual”, and a “Race” mode that has been specially designed for the Golf R. In combination with DCC, “Comfort” mode is also available. All modes were specifically tuned for the Golf R.
In “Race” mode, damping is increased and engine response and the shift points of the DSG transmission are configured to be even sportier. In the “Individual” driving profile, the driver can combine mode settings for various individual parameters. In the “Eco” driving profile, on the other hand, the engine controller, air conditioning, and other auxiliary units are controlled for optimal fuel economy. Vehicles with DSG also have a coasting function in Eco mode: When the driver releases the accelerator pedal, such as slowing down for a traffic light or going downhill, the DSG disengages and the engine idles. The Golf R has uprated brakes, shared with the GTI Performance. At the front, the car has 13.4-mm diameter vented discs that are 1.2 inches thick, while the rear rotors are 12.2 by 0.9 inches. The black brake calipers have the R logo on them: up front the brake pistons are 2.4 inches in diameter and are 1.7 inches at the back. Volkswagen R GmbH has developed numerous new exterior features for the flagship Golf. They include the bumpers, side skirts, rear diffuser, dual chrome exhaust tips per side, the lighting design, and standard 18-inch and optional 19-inch aluminum-alloy wheels. Front end. The Golf R can be distinguished from the front by a new bumper design with exceptionally large air inlets, a modified radiator grille that sports an “R” logo, and newly developed daytime running lights that are integrated into the Bi-Xenon headlight housings. 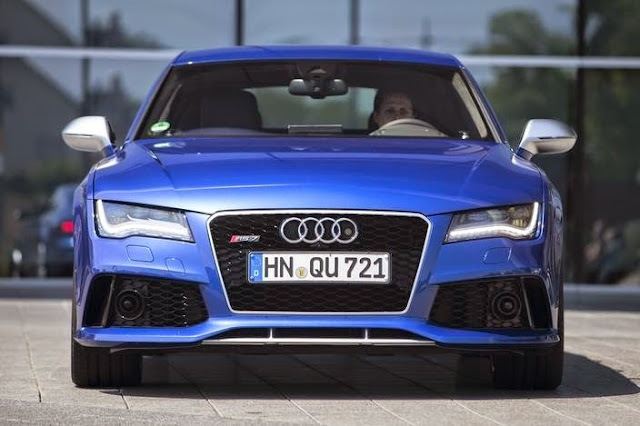 The LED daytime running lights form a distinctive dual “U” design beneath the headlights. Side profile. From the side, the Golf R is characterized by newly designed 18-inch “Cadiz” aluminum-alloy wheels shod with 225/40 tires, black brake calipers with the “R” logo, body-color “R”-style side skirts, “R” badges on the front fenders, and “Matt chrome” door mirror caps. The car may also be ordered with optional “Cadiz” 19-inch aluminum-alloy wheels or “Pretoria” motorsports-style wheels. Rear section. Rear details that define the new Golf R include smoked LED taillights with a distinctive light-colored stripe in the middle, an “R” design diffuser, four chrome tailpipes, and an “R” logo on the trunklid. Eight colors. The range of exterior paints comprises eight body colors. A new paint was created specifically and exclusively for the Golf R: “Lapis Blue Metallic”. Alternative color choices are “Pure White”, “Tornado Red”, “Night Blue”, “Limestone Grey Metallic”, “Reflex Silver Metallic”, “Deep Black Pearl Effect” and “Oryx White”. As in the three previous Golf R models, Volkswagen R GmbH has extensively upgraded the interior. The most powerful Golf is equipped with what are known as top sport seats in the front. The middle panels are designed in “Race” fabric (“Titan Black”) with black backstitching. Meanwhile, the side panels are executed in Alcantara (“Crystal Grey”). The outer surfaces of the seats and the head restraints are designed in “Clip” cloth upholstery (“Titan Black”). “Crystal Grey” decorative seams form a contrast to the dark areas. An “R” logo is embossed on the backrests of the front seats. As an option, Volkswagen also offers a Nappa-carbon leather package. Here, the outer seat surfaces, inner side support panels, and head restraints are all upholstered in dark “Carbon” Nappa leather. Meanwhile, the middle seat panels may be ordered in either dark or light Nappa leather (“Anthracite” or “Modern Grey”). The decorative seams are also “Crystal Grey”. Leather is also used to trim the upper and lower grip zones of the three-spoke “R” sport steering wheel. Last but not least, the steering wheel’s lower cross bar has a chrome “R” logo. The decorative inlays of the dashboard and door trim panels feature the “Carbon Touch” design; ambient lighting is also integrated in the door trim panels as standard. The door sill guards are illuminated as well (in blue). The pedals and foot supports are also designed with a stainless-steel look as standard. “R” design instruments. The instruments and the touchscreen’s start menu were also customized. When the ignition is switched on, the illuminated light-blue tach and speedometer needles sweep once across the entire scale to their end pins. The instrument needles are also automatically illuminated as soon as the driver’s door is opened. The radio or navigation-system touchscreen shows an animated “R” logo on startup.